You may think that your competitive advantage in the marketplace relies on your patented processes or on the highly-skilled workers you managed to retain. But the truth is, people and products aren’t things that are intrinsically a company’s – competitors can easily hire away your best people and gain access to the knowledge that supports your processes. The only thing they cannot duplicate, no matter how much they try, is your corporate cultureClick To Tweet – and that is really the only sustainable competitive advantage you have. What Is Corporate Culture and How Do You Get One? Vision: A memorable statement that outlines the company’s purpose and helps guide its values. Values: A set of guidelines defining the behaviors and mindsets required to achieve the outlined vision. Practices: The totality of methods and processes employed by the company in the pursuit of its objectives. People: Employees who share and embrace a company’s core values, reinforcing the culture it already has. Narrative: A well-honed founding story that helps a company connect with employees, investors, and clients. Workplace: A space that shapes the values and behaviors of workers, reinforcing the culture a company is trying to create. The physical workspace influences behaviors by structuring relationships between members of an organization. It encourages some communication patterns while discouraging others. More importantly, it tells people how the company operates, what it values, where it has been, and where it is heading. Some companies fail to establish a culture that drives customer and organizational success because they fail to understand that office space acts as a catalyst for collaboration, engagement, and innovation. Others may understand the importance of creating a space that supports their culture, but they only focus on the short-term instead of the big picture. Here are some of the most common workplace mistakes business owners do that prevent them from creating a strong corporate culture that works for them, their employees, and ultimately their customers. How Is Your Office Interior Design Messing with Your Culture? It doesn’t give people the option to change their environment. 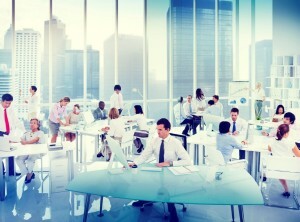 Creating a flexible workspace usually means increased productivity, more efficient use of space, and happier employees. Especially in areas designed for project planning and other collaborative activities, people should be given options to change their environment. A traditional setup with a bulky table in the center of the room and assigned seats no longer works. Workers prefer a room that’s adaptable because the work they do changes every hour of the day, so it makes it easier for them to be productive. Also, a flexible environment with unassigned seating allows you to relax hierarchies, so that workers can focus more on the collective goals of the company and less on how poorly they’re being treated. It doesn’t facilitate chance encounters. Chance encounters are necessary to increase familiarity between the members of an organization and to spark conversations that may lead to innovative solutions. Stairs are no longer placed in the back of the office – they now have a central position in most modern office environments. Nooks are placed near areas designated for coffee, eating, and printing to give people the privacy they need to finish a conversation started in one of these common areas. Glass is now replacing concrete for conference room walls in order to establish a vivid environment and keep the mind awake. No longer is priority given to functional and aesthetical considerations – the office of the future is built around human potential, productivity, and performance. It doesn’t consider worker and workplace wellbeing. Co-author of the book Wellbeing Tom Rath notes that, “The most successful organizations are now turning attention to employee wellbeing as a way to gain emotional, financial and competitive advantage.” In a workplace that doesn’t promote and support worker wellbeing, people are overly worked and overly stressed, and they rarely can meet challenges in an effective way to help move the company forward. Although they still come into work, they are unproductive mentally, and this leads to costs that are almost twice the cost of absenteeism in certain countries. The key is to have a broad attention to employee wellbeing and take into consideration aspects that go beyond the physical, such as the emotional and cognitive processes that influence and support worker performance and productivity. Creating a strong and unique culture is certainly not an easy thing, but having a physical space that communicates to clients your mission and values is certainly an important step in that direction. Contact your local office space planner to talk more about your options to set up an office environment that doesn’t undermine your corporate culture.